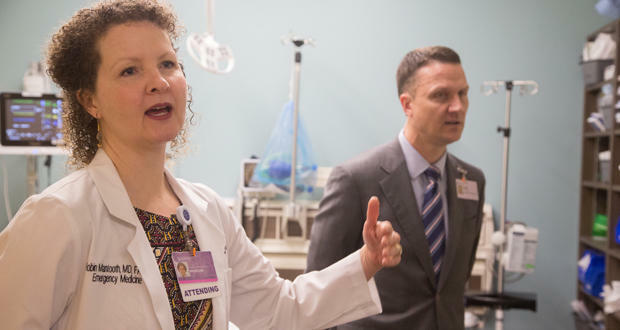 Emergency Department director Dr. Robin Mantooth and Chief Operating Officer John Manfredo lead a tour of the department at Norman Regional Health System’s new hospital building in Moore on January 17, 2017. One of Oklahoma’s health information exchanges will close. Coordinated Care Oklahoma announced on Monday that the non-profit organization plans to fold. Health information exchanges let healthcare providers share and access records across hospitals. Journal Record reporter Sarah Terry Cobo writes that Coordinated Care as in the process of merging with a competitor called MyHealth Access Network before making its sudden decision. Coordinated Care director, Dr. Rodolfo Alvarez del Castillo, announced that the closure would help cut costs for physician and hospital clients. Alvarez del Castillo said a large insurance provider required its physicians to participate in his competitor’s system, MyHealth Access Network. If they didn’t use MyHealth, the insurance provider wouldn’t keep those doctors within its network, he said. Paying for both services was too expensive for some small clinics and rural hospital systems, he said. “For some providers, (they said) it doesn’t feel right, like someone is twisting your arm,” he said. Journal Record editor Ted Streuli told KGOU that if providers did not adopt MyHealth, they were at risk of being booted from the big insurer’s network. “That took so many customers away from Coordinated Care that it just was no longer a viable model,” Streuli said. Coordinated Care’s closure eliminates competition in the health information exchange market, and forces providers to use MyHealth. But Streuli says it probably won’t have a huge impact on healthcare providers. “Oklahoma physicians have been really slow to adopt those shared medical records, so it will only affect those providers who are accustomed to using Coordinated Care,” Streuli said. Norman Regional Health System’s new CEO, John Manfredo, is trying to make sure patients use their local hospital. But the Journal Record’s Sarah Terry Cobo reports that’s a lot harder than it sounds. Hospitals don’t build the same loyalty that people often have toward a grocery store or restaurant, Streuli says. And there are benefits to using the same hospital, such as familiarity and easy access to medical records. “As we were just discussing about the lack of participation in some of the information exchanges, those records don’t always automatically follow the patient,” Streuli. Good customer service reviews help hospitals in a number of ways. First, those reviews are posted on the Medicare website. And, starting in July, hospitals could lose up to 6 percent off their Medicaid reimbursement rate if perform below their peers on certain quality measures. Jacob McCleland: Health information exchanges let healthcare providers share and access records across hospitals. Journal Record reporter Sarah Terry Cobo reports that Coordinated Care was really a pioneer in the field. What made them trailblazers, Ted? Tec Streuli: Well really the big thing was they were one of the first ones to jump in. The state set up a trust in 2008 that provided some money to establish some of those information exchanges. Coordinated Care was one of the first ones out of the gate with a pretty usable interface. McCleland: Coordinated Care was in the process of consolidating with a competitor. Did their closure come as a surprise? Streuli: Oh yeah, I think it was definitely a surprise. Coordinated Care operated as a nonprofit organization and the board of directors decided just Monday to pull the plug. That was really intended to be a cost-saving move, but it did call a halt to their merger with a competing organization. McCleland: So why is coordinated care shutting down? Streuli: Well, the big reason is that one of the big insurers decided to require their network providers to use a competing exchange called MyHealth. And if they didn’t do that, they were at risk of being booted out of the insurer’s network. That took so many customers away from Coordinated Care that it just was no longer a viable model. McCleland: Will this have impact at all on healthcare providers in Oklahoma? Streuli: Well, it eliminates competition and effectively forces all the providers to use MyHealth. But Oklahoma physicians have been really slow to adopt those shared medical records, so it’s only affect those provided who are accustomed to using Coordinated Care and now they’ll have to switch and get used to some different software. McCleland: Let’s stay on the healthcare topic a little while longer here. John Manfredo is the new CEO of Norman Regional Health and he told Sarah Terry Cobo that he needs to make sure people go to their local hospital. Why is that a lot harder than it sounds? Streuli: Hospitals don’t typically get a lot of brand loyalty. People typically will go to the nearest hospital or perhaps the one that has a particular specialist or a service that’s been recommended by their primary care physician. So unlike going to your favorite grocery store or restaurant, patients tend to pick a hospital on really a case-by-case basis. McCleland: What are the benefits of being loyal to one hospital? Streuli: Well really probably familiarity is the biggest plus, and not only does the patient feel comfortable with the staff and the surroundings, but the hospital is going to have all of that particular patient’s records right there at their fingertips. As we were just discussing about the lack of participation in some of the information exchanges, those records don’t always automatically follow the patient. So that can be another benefit. McCleland: How does Norman Regional stack up on customer service surveys, and why does that matter? Streuli: Well, in a lot of cases, they did really well. They were at or above both the state and national averages in a lot of categories about information they were getting related to recovery, about their experience in the rooms, things like that. And most importantly, they scored high on overall satisfaction. They didn’t do quite as well in several other categories, such as doctor and nurse communication with patients. The reason that’s so important is those scores get published on Medicaid’s website, so patients can really take a look at a hospital and judge whether they want to use that one or not based on their customer satisfaction scores. But perhaps more directly important to the hospitals is they have to report to the U.S. Department of Health and Human Services how satisfied patients are in 27 different categories. And beginning in July, hospital systems could lose up to 6 percent of their Medicaid reimbursements if they perform below their peers on some of those quality measures.